TC Electronic is known for being at the forefront of guitar effects. They have fully embraced the digital age, which is apparent in most of their models. TC Electronic Polytune 2 comes in as one of the best pedals you can have for acoustic electric guitar.Lets find out why. When you look at TC ElectronicPolytune 2, it looks equal parts like a standard guitar effects pedal, but equal parts as some sort of tech gadget. TC Electronic basically retained the standard effects pedal design, however went on to improve it to a point where it’s on a whole different level. The chassis is made of die cast aluminum and features a white finish. The entire upper portion of the top panel is dedicated to a large display, which is more or less where the magic happens. In terms of build quality, don’t be fooled by this modern appearance. It’s is built to withstand frequent stage use. Inputs and outputs are located on the sides of the pedal, with a DC port in the back. As usual, you can use a 9V battery as well, however this is one of those thirsty pedals that make quick work of batteries. Performance is by far the best thing about TC ElectronicPolytune 2. Before we get any further, let’s just talk a bit about the main reason this thing has become so popular. Polytuning is the next step in tuner design. This new technology allows you to read which strings are out of tune simply by strumming a chord. No longer do you have to go one string at a time. While this decreases the necessary time to tune an instrument, it doesn’t take away from Polytune 2’s accuracy. This thing will zero a key with 0.1 cent margin of error. Compared to a standard tuner, that is like going from a hatchet to a scalpel. As we have mentioned before, TC Electronic has included several presets and tuning modes, including a Drop D mode and Capo mode. Overall, this is one of the most powerful tuners available. TC Electronic has done it again. They’ve ironed out the original design and released a Polytune tuner that is near perfect. Not only is it effective and precise, but it is also very easy to use. Those who need a good tool for stage use, should check this thing out. 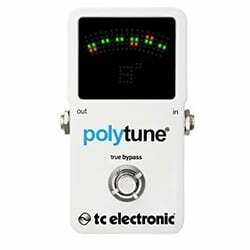 For more info about the TC Electronic Polytune 2, click here.